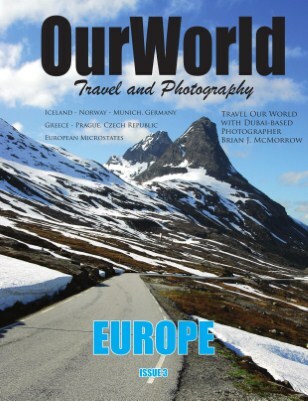 Here, in the 3rd issue of OurWorld Travel & Photography, we will start by scratching the surface in Scandinavia showing you Europe's less known natural face with extensive coverage of Iceland and Norway. We'll also hit a pair of Europe's most happening cities, the twin beer capitals of Munich and Prague. History buffs will appreciate exploring just how the six European Microstates - San Marino, Monaco, Vatican City, Andorra, Malta and Liechtenstein - have managed to emerge as independent countries, staving off the advances of their much larger and more powerful neighbors. Delving further back into history, we'll end our European tour in the cultural cradle of Western Civilization with a look at Greece though the ages.